Obituary – Swart, Verna Lee (Shelton) « Perry High School Alumni Association, Inc. Junior Play 47, Band 45-48, Library 45-48, Y-Teens 46-48. Verna Lee Swart, 80, of Perry, Oklahoma was the daughter of J. Roy Shelton and Clara Darmer. She was born December 8, 1930 in Perry, Oklahoma and passed away April 16, 2011 at her daughters residence in Stillwater, Oklahoma. 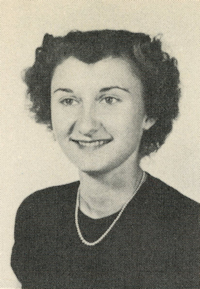 She was a 1948 graduate of Perry High School. Verna married Marvin Chester Swart on September 11, 1949 in Perry, Oklahoma, and he preceded her in death on November 18, 1992. Verna enjoyed quilting, flower gardening, cooking and was an excellent seamstress. Memorial Services will be 2:00 p.m. Wednesday, April 20, 2011 at the Brown Dugger Funeral Home Chapel. Inurnment will follow in the Grace Hill Cemetery. Services are under the direction of BrownDugger Funeral Home, Perry, Oklahoma. Memorials may be made to Judith Karman Hospice, in care of BrownDugger Funeral Home, 1010 N. 7th Street, Perry, Oklahoma 73077. Verna is survived by one son, Terry Swart and his wife Jane of Oklahoma City, Oklahoma, two daughters, Beverly Fortune and her husband Oscar of Stillwater, Oklahoma, Marva Laughlin of Duncan, Oklahoma, four grandchildren, Casey Templeton, Kurt Swart, Nicholas Swart and his wife Janelle all of Bartlesville, Oklahoma, Matthew Fortune of Stillwater, Oklahoma, eight great-grandchildren, two brothers Leonard Shelton and his wife Anna of Perry, Oklahoma, Ralph Shelton and his wife Darlene of Perkins, Oklahoma and one sister, Barbara Sweger of Stillwater, Oklahoma. She was preceded in death by her parents J. Roy Shelton and Clara Shelton her husband Marvin Chester Swart.